So we’re over half the way through the season. The Capitals are the in the midst of a tear through the league right now. Their record dating back to November 20th is 20-2-2. That’s obscene. Things are a bit rosier than where I left off last time. But this team isn’t perfect in a literal sense. So let’s go ahead and visit on all the usual suspects to see just how good this team is. I considered not including this plot, because it doesn’t serve a purpose. The Caps are winning, we all know that. The Caps are well on their way to the playoffs. One analytical model doesn’t have any simulations in which the Caps miss out on the postseason, after 1 million iterations of their model. 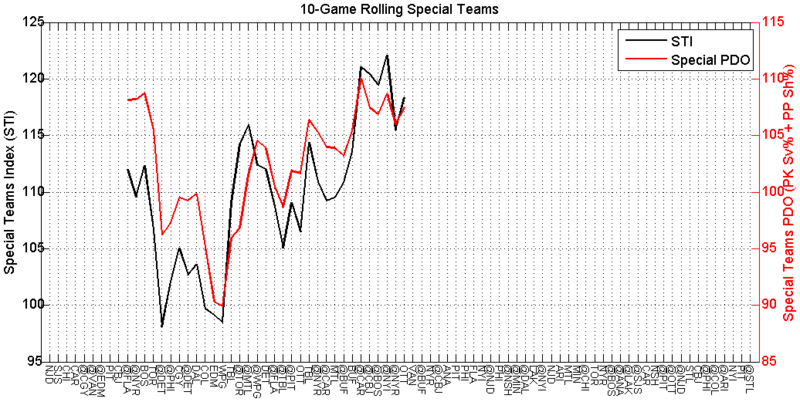 The only reason I included this graphic is to illustrate just how stratospheric this team is playing right now. Fun times. The Capitals need to win, like, 12 more games to clinch a playoff spot. It's January 11th. 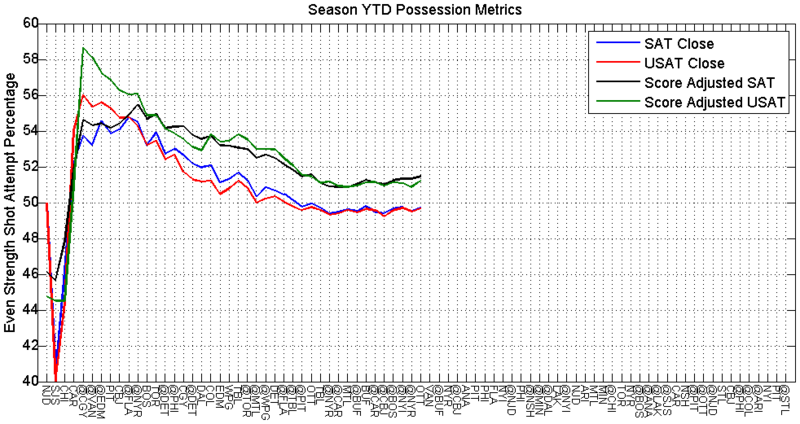 The possession has begun a bit of a resurgence. Thankfully. The recent 10-game rolling data has all eclipsed the 50% mark again, with the score-adjusted SAT% leading the charge. 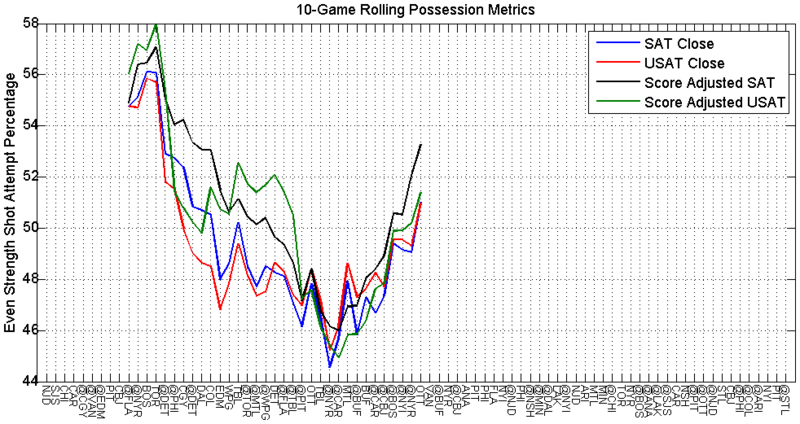 You can see game-by-game that there’s still a bit of a mixed bag in terms of the possession battle. There aren’t many games where it’s clear the Caps outplayed the opponent with the puck. I’m beginning to be rather curious about how the Caps approach certain situations and if this plays a role in them being dominant in the standings, while not being quite as dominant with possession. Obviously there are other factors – such as an elite goaltender, the best goal scorer in the game, a couple dynamic scoring threat centers, and excellent special teams, that will contribute to wins without the team having to continuously win the possession battle. 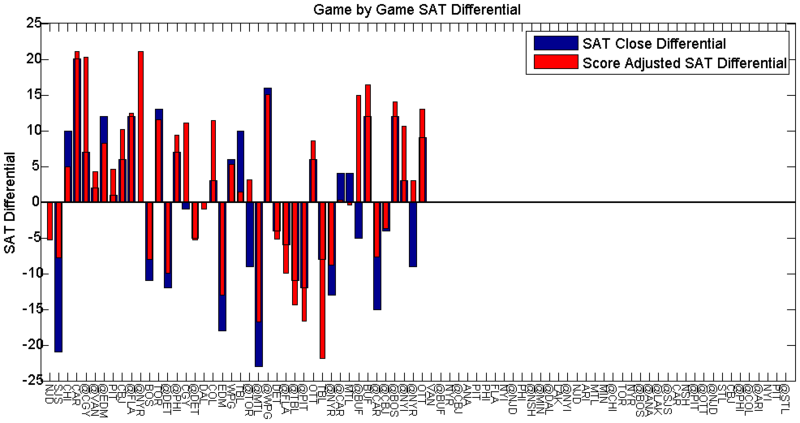 There’s also the factor that the Caps are quite often leading on the scoreboard. And I’m sure it’s difficult for the team to maintain the same level of intensity and focus throughout the grind of the regular season when things seem to be so well in-hand. 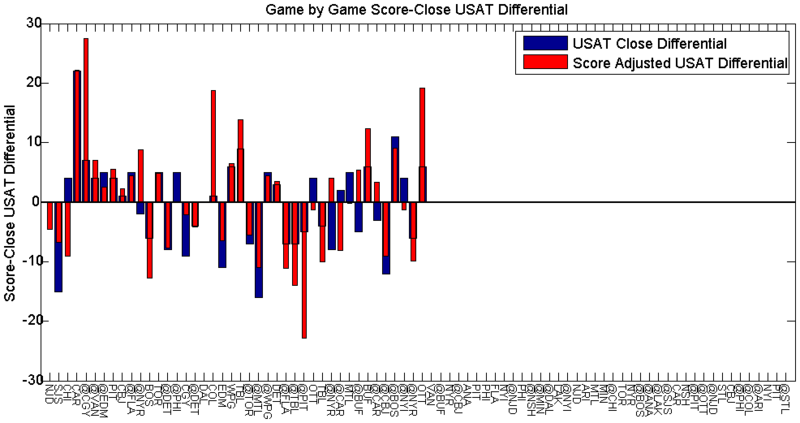 Either way I find the Caps a curious case with how to assess their performance aside from whether they won, got out-shot, or out-attempted. 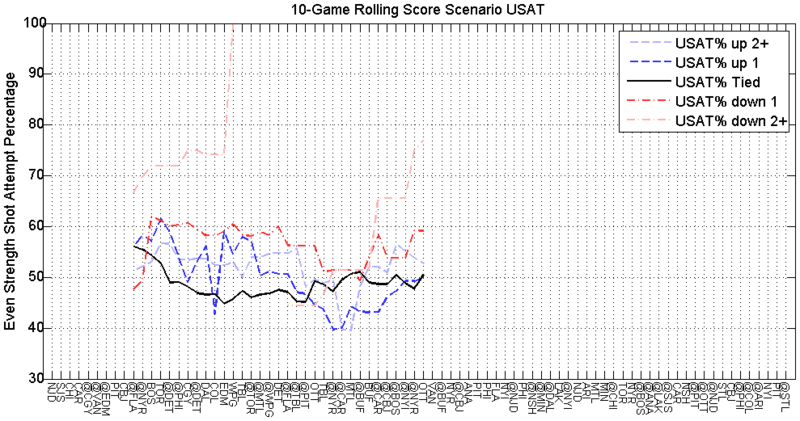 There are plenty of games where the SAT, USAT, SOG don’t seem to tell the story, even if you look at close-score scenarios or you adjust for score through the whole game. 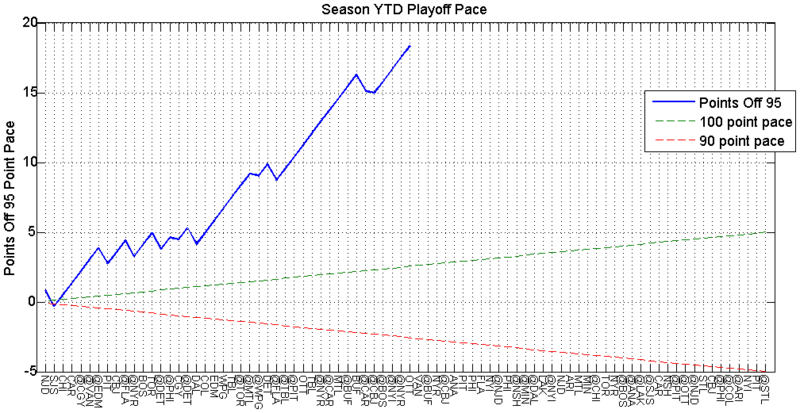 This is definitely an element to keep a watchful eye on through the remaining half of the season. 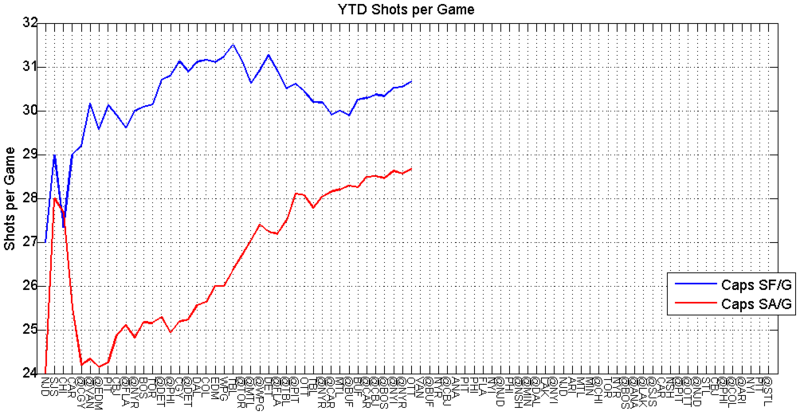 The Caps are continuing to allow more shots on goal than I’d personally like to see. 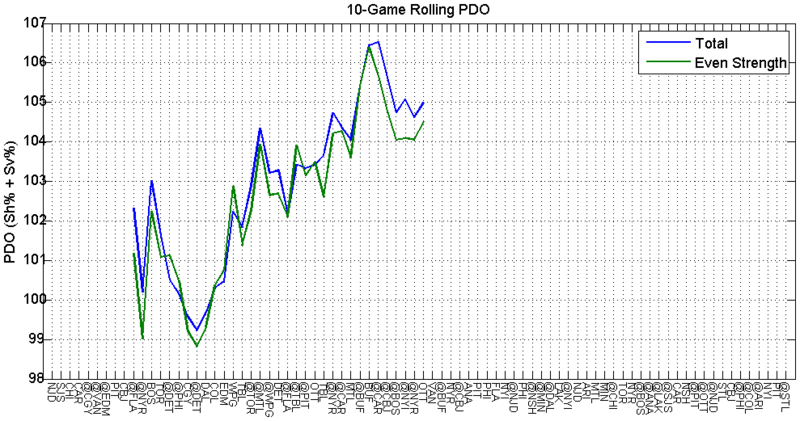 But the overall picture still looks good, and there’s been a good bounce back up in the even strength offense lately. The defense could certainly use its top 2 defenders back though. The shots against numbers are getting comfortable higher than I’m sure the team wants. 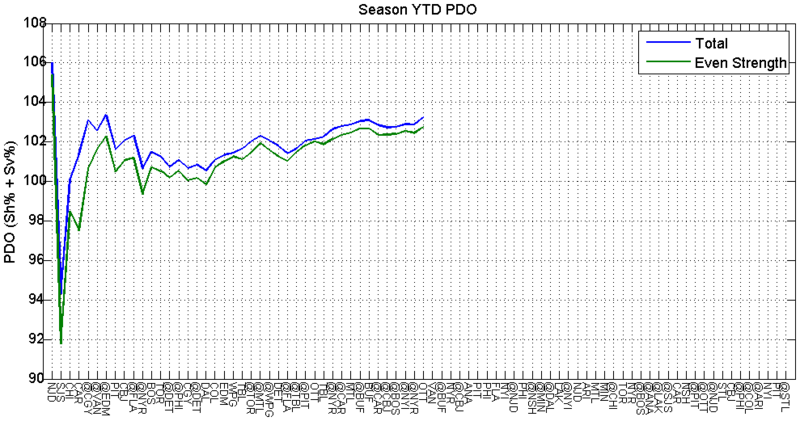 Yeah, still waiting on that PDO bender hangover. I expect it to come in the form of a sudden drought of offense. 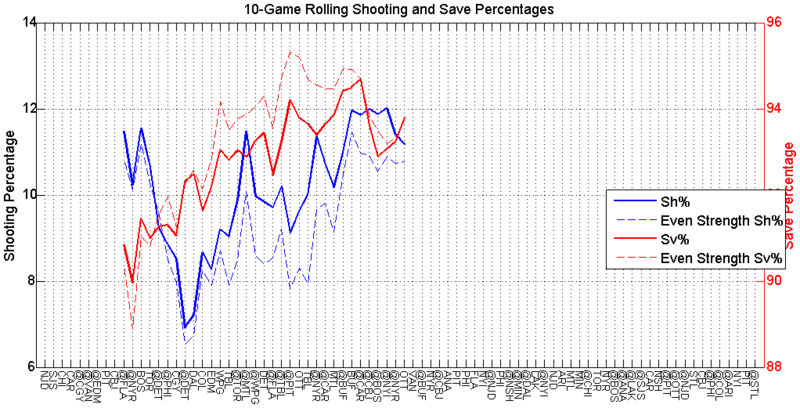 I don’t find the 93% ES Sv% to be too far off the mark for Holtby and even Grubauer. But a 9.8% ES Sh%? Yeah that’s probably quite a bit too high, even with the talent this team has. I’ve said it before, and so have others, but I still believe this team’s true talent is definitely above a 100 PDO, buoyed mostly by Holtby, but also because of the offensive capabilities of Ovechkin, Backstrom, and Kuznetsov. I’m looking mostly at the Even Strength data as I make these assumptions. The special teams are a different animal, and it’s quite possible that the percentages the Caps get a man up or a man down aren’t just puck luck. Maybe I should rephrase that last sentence. I hope the percentages the Caps get while up or down a man aren’t just puck luck. 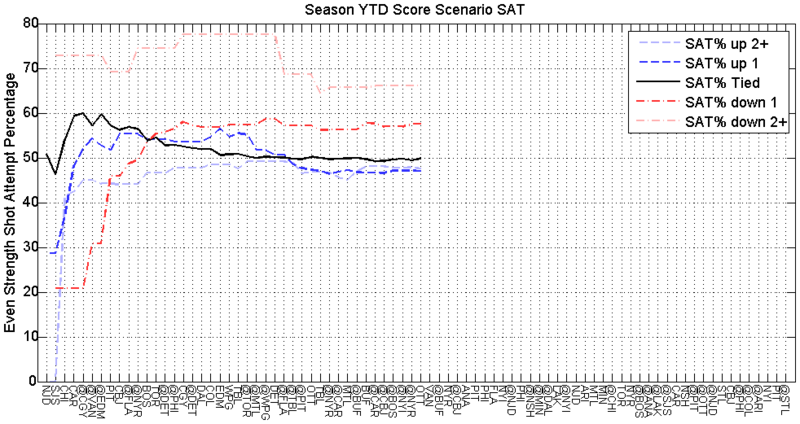 Because a crash from a 104.4 Special Teams PDO could hurt. Maybe I’m spoiled, but I always thought the Caps would shoot at a higher percentage on the powerplay than what we’re seeing now. 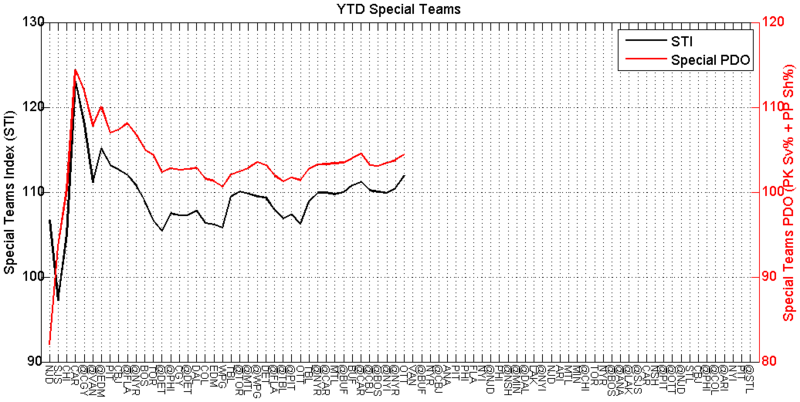 Last year they were over 16% on the season, this year they’re under 15%. Maybe Ovi has a hot streak in him for the second half of the season (he’s shooting 6.3% less effectively than his last two seasons). 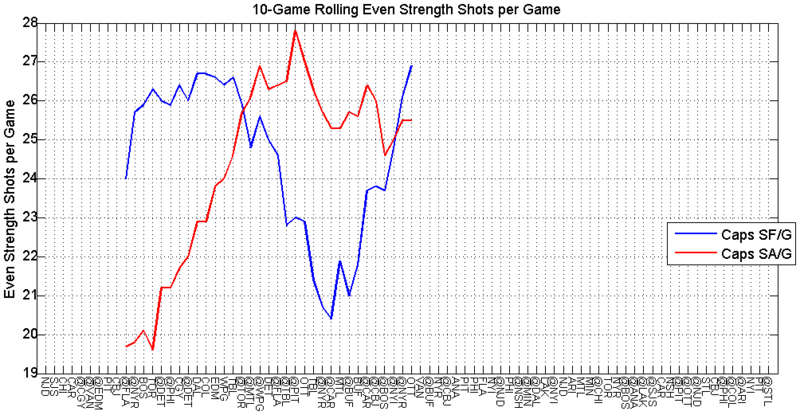 Or maybe the unit last season was overly deferential to Ovi, thus getting less shots and more deadly one-timers. 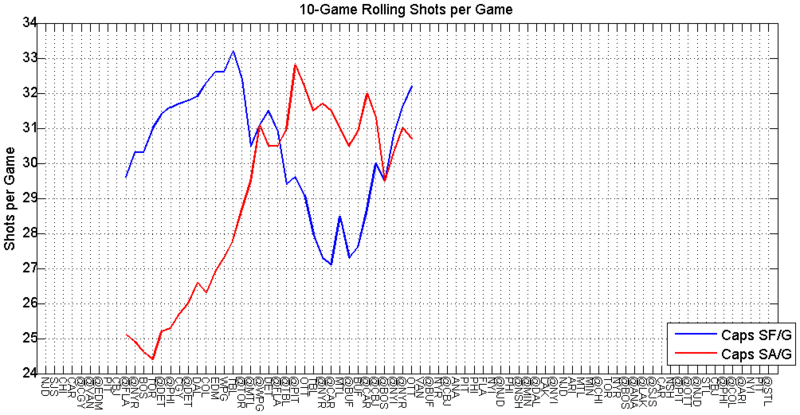 Or maybe even the Ovi-timer setup isn’t as effective this season. Whatever it is, it’s silly to dwell on. 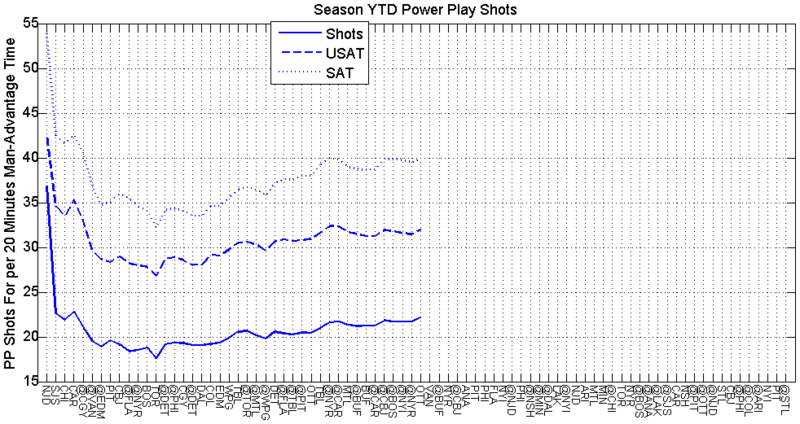 The powerplay doesn’t really seem to need any real work. Except from the refs. 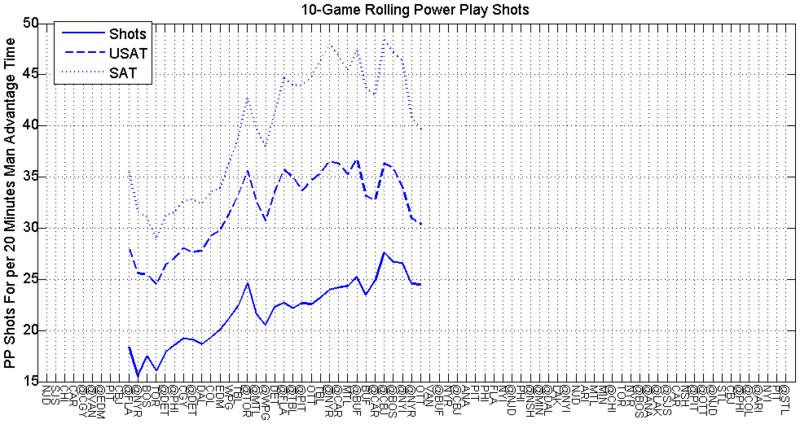 The Caps are getting 1 less powerplay opportunity per game than they were getting 11 games ago. 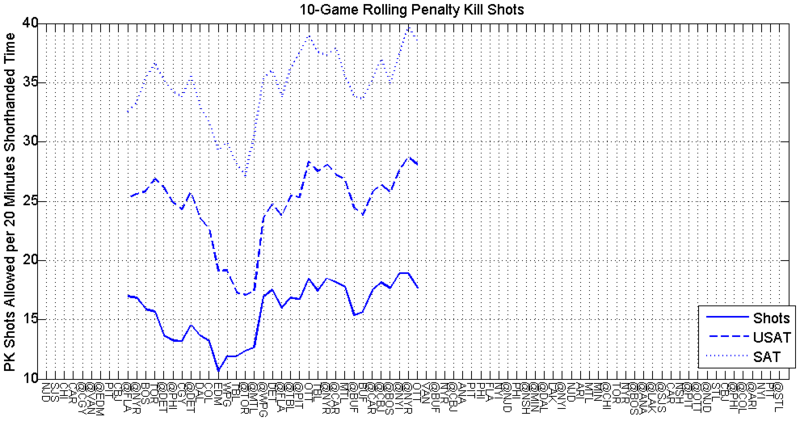 If I’m hoping for a positive effect regression for the efficacy of the powerplay, a negative effect regression on the penalty kill is probably just as likely. 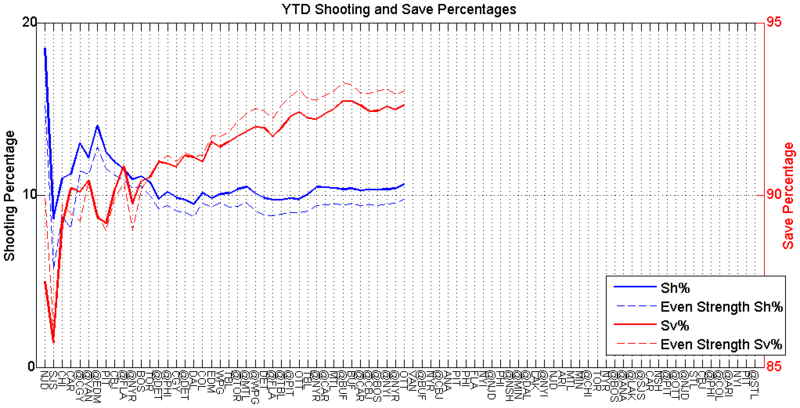 The 10-game rolling save percentage is rocketing up. 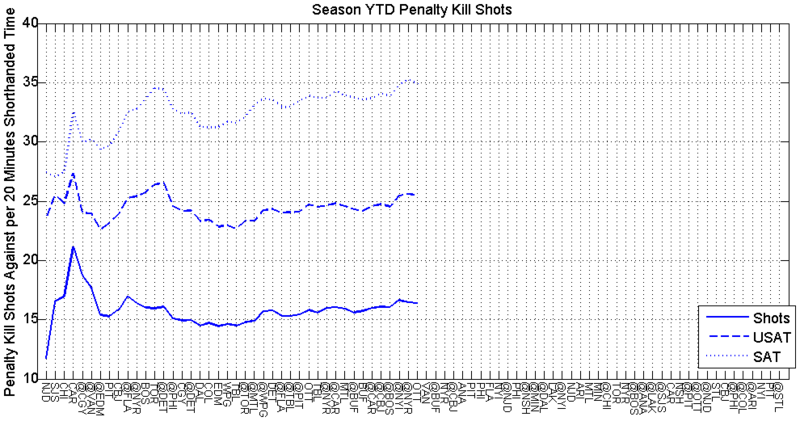 Holtby and Grubauer are good, but 93.48% Sv% on the penalty kill is pretty gaudy. That will probably fall soon. Especially if ::adjusts tin foil hat:: the refs continue to conspire against Wilson. I know it’s a silly conspiracy theory, but he got 5 for getting punched in the face against Ottawa. It’s just getting dumb now. So those PKs/game numbers concern me, but I can only just shrug my shoulders at it. The biggest issue I have with the Caps possession is the values in a tied game. I know the Caps have a lot more time spent while leading (over 2x the TOI compared to trailing) and the coefficients used to weight the score states may not be accurate to the Caps in particular, but they also have a lot of time in tied games. They’re not even breaking even in unblocked shot attempts (49.57%) when the score is tied. I’d like to see them tip this particular scale in their favor, over anything else. 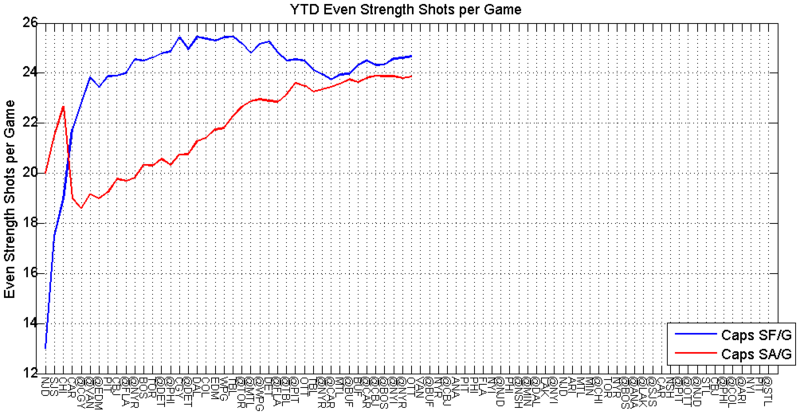 Most of what is shown in the unblocked shot attempt data, is reflected in the total shot attempt data. One thing to note: if the Caps do happen to trail, the other team better watch out. They turn into a different team. I’m trying not to overanalyze. I just want to briefly visit on just about everything I can, to see how the Caps are doing and if anything is on the bubble, ready to burst. Overall, this team is incredible. And I know all anyone cares about this season is what happens in April-June, but let’s enjoy this team now, and not overlook what they’ve managed to accomplish thus far. And never take Ovi for granted. Cherish every game you get to watch him in a Washington sweater.